For details on how these scores are developed see The National Longitudinal Survey of Children and Youth (NLSCY) http://www23.statcan.gc.ca/imdb/p2SV.pl?Function=getSurvey&SDDS=4450 -accessed June 22, 2017; and, the Survey of Young Canadians (SYC) http://www23.statcan.gc.ca/imdb/p2SV.pl?Function=getSurvey&SDDS=5179 -accessed June 22, 2017. 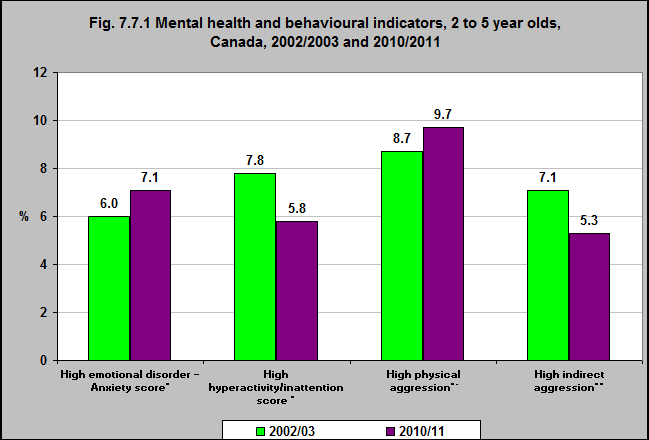 Source: CICH graphic created using data adapted from the National Longitudinal Survey of Children and Youth 2002/2003, Statistics Canada – custom runs and Survey of Young Canadians 2010/2011, Statistics Canada – custom runs. In 2010/11, 7% of 2 to 5 year-olds scored high on the emotional disorder – anxiety score. This was up from 6% in 2002/03. Approximately 6% scored high on the hyperactivity/inattention scale in 2010/11, down from approximately 8% in 2002/03. Almost 10% scored high on the physical aggression scale in 2010/11, in comparison with almost 9% in 2002/03. 5.3% of 4 to 5 year-olds scored high on the indirect aggression scale in 2010/11, down from 7% in 2002/03.